Been diving in Beqa Lagoon? Please Vote! Halfway around the world, deep in the Pacific, a shark marine reserve is home to one of the best shark dives in the world. Descending through the warm, azure waters, throngs of jacks, snappers, and groupers which team from the bottom to the surface. The dive at Beqa Lagoon (also called The Arena) is conducted in two stages, the kneeling on the bottom with a giant Fijian man watching yours, and the sharks every move, I have never felt so safe underwater. 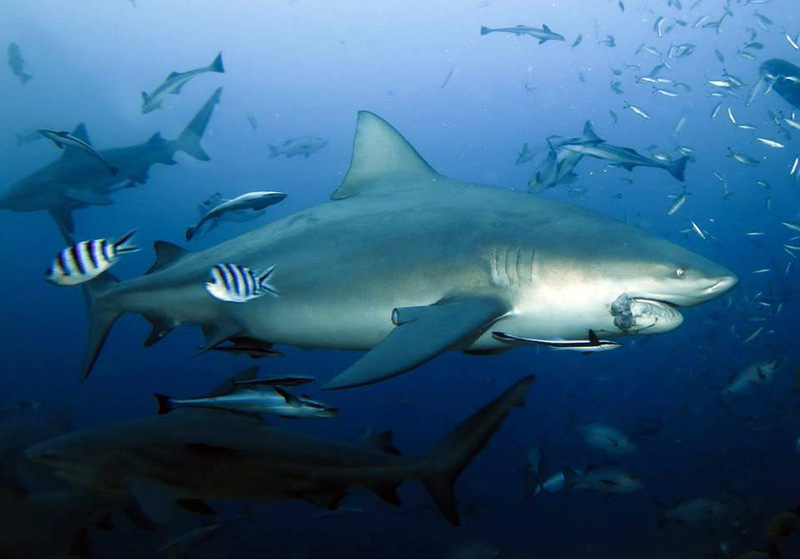 It is here, at 30 metres, at the entrance to Beqa Lagoon the main attraction appears; the Bull Shark. After spending over 10 minutes with these giants, the dive guide brings us into the shallows where smaller shark species such as reef sharks, can be found gliding in the current. The second Shark Dive takes place halfway down the reef slope at 16m. Often nurse sharks appear first before the Bulls intimidate them. This is where I witness most of the feeding, their powerful jaws crushing the fish before our eyes. Silvertip reef, Lemon sharks, Grey reef and if lucky Tigers can also appear when the Bulls allow.